Unlike the continental United States, all of Alaska is not connected by highways and roads. So, if you’re in Alaska for any sort of extended stay, odds are that you’ll need to take one of the ferries at some point. It’s also extremely likely that you’ll need to do so with your car too. The good thing is that all of Alaska’s Ferries operating on the Alaska Marine Highway System have room for your vehicle on-board. Some have more space than others, but if you book ahead of time, you should have no trouble finding space for yourself or your car. The Alaska Marine Highway System is Alaska’s most reliable nautical transportation service between coastal communities. Today, it is recognized as a National Scenic Byway as well as an All-American Road. It currently services almost four thousand miles of the gorgeous Alaskan coastline and connects over thirty communities. Some of which cannot be reached by car alone. There’s several routes and eleven different vessels. Consider the thirty communities these ferries travel between and you can see how someone can get easily confused when trying to coordinate their ferry voyage. However, you can use this handy guide to get to where you’re going by ferry with ease. These are the biggest ferries in the fleet. It almost always takes over twenty-four hours to go from the first port to the last port on the route on one of these mainline vessels. If you are going to be on one of these Ferries overnight, you can rent a cabin on-board to sleep in or you can set up a tent or sleeping bag on the deck. Depending on the season, the second option might not be such a good idea. There are also several places to buy food and drink on-board as well. This Ferry is named after the Columbia Glacier and is quite large, the largest of the fleet. It cost twenty million dollars to build. It can carry just under five hundred passengers and has a car-carrying capacity of about a hundred and thirty vehicles. It also has over a hundred cabins, about half of which are for up to four people and the other half can fit two people. The MV Columbia also boasts many great on-board conveniences. It has a dining room, a restaurant, a couple of lounges including a movie screening lounge, laundry and more. The MV Kennicott is named after the Kennicott Glacier and can be used as a command center for emergency teams in case of an ocean emergency like an oil spill. It has a helicopter pad and a floating dock in case it does need to be used this way. It also has an elevator specifically for loading and unloading cars. This ferry can carry about five hundred passengers but can only carry about seventy-five vehicles. It has over a hundred cabins pretty much split between two-person and four-person capacity. The MV Kennicott has many nice amenities as well. It has a couple observation decks, a heated solarium, and a few lounges including a movie lounge. The MV Malaspina got its name from the Masaspina Glacier and was one of the three original Alaska Marine Highway System ferries. It can carry four hundred and fifty passengers and eighty-three vehicles. It also has just over seventy cabins with both two and four person capacities. It’s amenities for those on board include lounges including a movie lounge and a heated solarium. Named after the Matanuska Glacier, the MV Matanuska was also one of the three original Alaska Marine Highway System ferries. It can carry four hundred and fifty passengers as well as eighty-three cars. There are a hundred cabins with capacities for two or three people. The ferry also includes a restaurant, a heated solarium, a movie lounge and a child’s play area. This ferry is named after the Tustumena glacier and has an elevator on-board especially made for loading and un-loading cars. It the smallest Alaska Marine Highway System ferry that has cabins. It can carry a hundred and thirty passengers as well as thirty-four cars. It offers passengers a dining room, movie lounge, heated solarium and more. The purpose of these ferries is to get people from one small community to another as well as with the mainline ferry routes. You can expect a shorter trip on these ships. Named for the Aurora Glacier, this ferry can hold up to two hundred and fifty passengers as well as thirty-three cars. It has observations lounges, a movie lounge, a heated solarium and showers available. The MV LeConte got its name from the LeConte Glacier. It can carry two hundred and twenty-five passengers as well as thirty-three vehicles. This ship also boasts a restaurant, heated solarium and movie lounge as well. These are essentially smaller and more limited day boat ferries. They generally only operate back and forth between a couple of small communities each day. Named after the Chenega Glacier, the FVF Glacier is one of the fastest ferries in the Alaska Marine Highway System ferry fleet. It is one of the very first ferries of its kind in the entire United States. It carries up to two hundred and ten passengers and thirty-one cars. It also has a snack bar, lounges, child’s play area and a study area as well. Taking its name from the Fairweather Glacier, is also one of the Fastest ferries in the Alaska Marine Highway System ferry fleet. It can hold up to two hundred and ten passengers as well as thirty-one cars. The amenities consist of a snack bar, kid’s play area, solarium and lounges. The MV Lituya was named after the Lituya Glacier and is the smallest ferry in the Alaska Marine Highway System ferry fleet. It is also the only vessel in the fleet that is dedicated to a single route (it only goes from Ketchikan to Metlakatla and back). The ship can hold up to a hundred and twenty-five passengers and fifteen cars. The perks of being on-board include a couple of lounges and viewing areas. The schedules for each of these ferries, for every one of their routes for the entire year would be too detailed to post here, so you can them here. However, there are more general details that you should be aware of. For example, there are many more departures in the summer months than there are any other time of the year. By the same logic, the winter has the least amount of departures. This is based on demand which is generated by increases in tourism or lack thereof for the most part. Passengers – The number of passengers is a part of determining your fare. The age of the passengers also matters too. Ages are broken into seniors (65+), adults (12+), child (6-11) and child (0-5). Vehicle – Your vehicle takes part in determining your fare as well. The make and model of your car adds weight and space to the shipment. Thus, it adds extra money to the fare the larger the car. Carry-on Items – Carry on items are classified as: bikes, pets, kayaks and inflatables. These items will require extra room on the ship, so, there is a small additional charge involved. Route Selection – This should be fairly obvious but the route you choose will determine the bulk of your cost for your trip. The further that you are going, the more it will cost you. Passenger limit – If you have ten or more people that you are trying to book, you will need to contact them personally. You can do so by e-mailing them at this address. Unaccompanied minors – Although their website does not specify, there are restrictions and qualifications for unaccompanied minors. Get it touch with them before-hand to make sure everything regarding your minor checks out. Vehicle length – The maximum length for a vehicle is thirty feet. The vast majority of cars will fall under this length, so, most of you will not need to worry. Vehicle restrictions – Outside of the length restriction, there are restrictions regarding unaccompanied vehicles and commercial vehicles. You need to contact them if either of those situations applies to you. Cabin Limit – You can only book three cabins per trip. For most of the larger ships, this means twelve people. 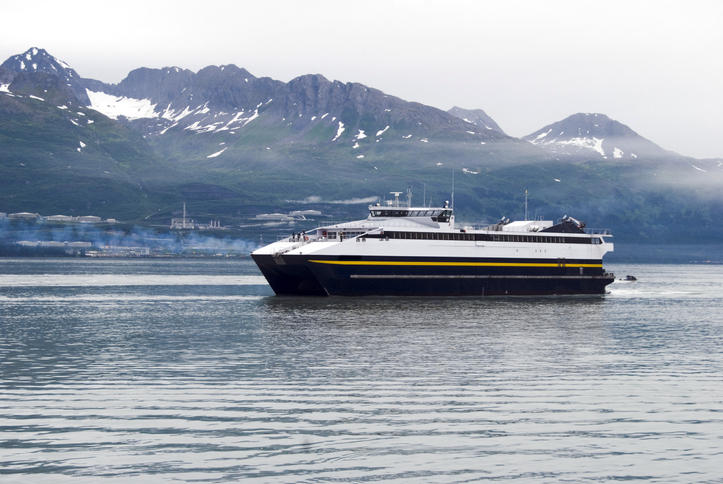 There are many policies in place for Alaska Marine Highway System ferries. You should consult their policies page here. Their policies include: animal transport, baggage, conduct, lost and found, marijuana, service animals and more. Commercial cars and trailers – You need to contact Alaska Marine Highway System ferries if you plan on bringing any commercial vehicle with you during your trip. Kayaks, canoes and inflatables – If you have a kayak, canoe or inflatable you can bring it along as long as it’s being transported with a car. If it’s not it will need its own ticket. Standard Cars – Standard cars are considered anything up to eight feet in length. Oversized cars – Oversized cars are considered a hundred and three inches and over. If your car is between a hundred and three and a hundred and eight inches long, there will be an extra twenty five percent charge. If your vehicle is a hundred and eight inches long or more, you will be charged an extra fifty percent. Motorcycles – You must bring the appropriate tie-downs for your motorcycle. If you are unsure of what this means for you, be sure to contact Alaska Marine Highway System ferries. Recreational vehicles – You must make clear that you are shipping an RV when you are making your reservation. You can not use your RV for dining or sleeping while you are on the boat. Unaccompanied vehicles – Any car that isn’t with a passenger will get charged an additional fee. How much the fee is depends on the destination port. You must also make sure that you make arrangements to have the car removed from the ship upon arrival. If you do not, you will be charged a fee to have the RV towed off the ship. Port restrictions – There are several port-specific restrictions that may apply to your vehicle. You can read more here. The Southeast route includes communities from Bellingham, Washington and Prince Rupert, British Columbia, through the Inside Passage, all the way to Yakutat. Routes in this region can take anywhere from an hour to thirty-eight hours depending on where you are traveling to and from. The Gulf of Alaska route includes ports in Prince William Sound and the Kenai Peninsula. Routes in this region can take anywhere from nine hours to thirty-eight hours depending on where you are traveling to and from. The Southwest routes include ports from the Kodiak Island Archipelago, the Alaska Peninsula, and out of the Aleutian Chain to Dutch Harbor. Routes in this region can take anywhere from six hours to nine hours depending on where you are traveling to and from. Taking the ferry in Alaska can be a particularly complex process. However, many times it is the only way to get from one specific spot to another. It’s also a pleasant experience where you’ll have great views of the Alaskan wilderness the whole way. Be sure you contact the ferry beforehand if you aren’t sure of something.